The good news: New York now has about 130,000 cyclists daily, and the city has committed to building 200 miles of new bike lanes by next year. The bad news: It's still dangerous out there for bikers, with 23 cyclist deaths last year. 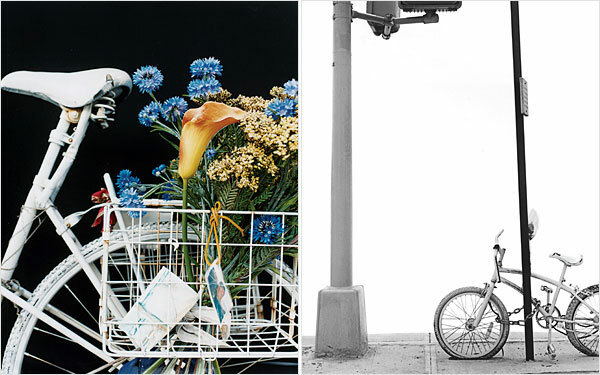 NY Mag has a beautifully photographed feature this week on the Ghost Bike project, a series of 35 white bikes throughout the five boroughs memorializing 35 bicyclists' deaths. The fascinating part was how egalitarian death-by-delivery-truck is: the variety of lives cut short by city traffic ranged from a Manhattan doctor who made house calls to a small boy in East New York on his way home from winning a Little League game.